All aircraft have brand new skins, built from my Home Grown Template . VA-115, USS Philippine Sea 1950-51? This is a complete aircraft (well, minus the Stock Lod  of course! ), with a new radar-equipped cockpit by Dels. Skins are still in bmp format, making it usable in all SF2 merged game installs with access to the A-1H.lod. All markings are decals and are Randomized. 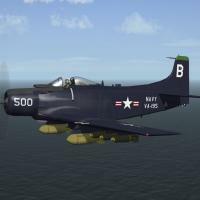 BuNums are accurate for the aircraft variant depicted, but not for the actual ones used by the squadrons; consider them 'generic' for that purpose. The 'USMC50s' pilot figure, AN/APS-4 radar pod and engine sounds are included. All weapons are included* (simple edits can make the stock 3W ones usable, if one has Expansion Pak 1). Wingfold is NOT activated, but the canopy is. Use the Usual Suspect (shift/0) to open and close it. All lighting is histerically correct. As always, fairly easy to follow, highly detailed install instructions are included. So, please read them. When in-game, you'll see "AD-4 Skyraider (3W)" on the selection drop-down.